Charity O'Connor is a woman who gets what she wants. Her stunning beauty and flirtatious way have always succeeded with men. Until Mitch Dennehy, that is. Brilliant and dangerously handsome, Mitch is a no-nonsense newspaperman who wants nothing to do with her. Charity burned him once, destroying his engagement to the only woma he ever truly loved. He won't play with matches again. but Charity has a plan to turn up the heat, hoping to ignite the heart of the man she lovse. And she always gets what she wants - one way or another. Or does she? Will her best-laid schemes win his love? Or will her seductive ways drive him away forever? 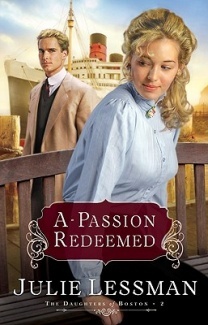 I said when I finished reviewing A Passion Most Pure, that the next book in the series - A Passion Redeemed - would have to wait until Speedbo finished. Well, turns out the allurement of the O'Connor saga was too strong! I couldn't resist picking it up to find out where Charity's scheming was going to take her. A Passion Redeemed is the second installment of the Daughters of Boston series. This is Charity's story - the second O'Connor daughter. It pretty much picks up straight off from where A Passion Most Pure left off. Charity continues her scheming and plotting in the hopes of snaring Mitch Dennehey. She won't take no for an answer. She plays a dangerous game - and it has serious consequences. Julie deals with some hard hitting issues in this book. Most of it happens off the page, and it is dealt with as neatly as possible so it doesn't become too emotionally difficult to read - which I was thankful for. I do wonder though if in reality Charity might have struggled a tad more to come to terms with what happens. I didn't enjoy this book quite as much as A Passion Most Pure - I think I identify more with Faith than with Charity. But I got to hand it to Julie for her imagination and ability to bring to life a scheming, manipulative - yet ultimately insecure young lady. Mitch is a great character - though I'm wondering what Mitch Dennehey ever did to Julie Lessman - the heartbreak she put this man through! Another powerful and passionate read from Julie Lessman. LOL, Helen, yes, I do put poor Mitch through the paces in this book (as I prophesy in the first line: Poor, unsuspecting Mitch. The poor boy--well, hardly a boy--doesn't stand a chance"). :) But trust me, I LOVE the man -- he and Luke McGee (Katie's love interest from A Hope Undaunted) are neck-in-neck as my faves. It's funny how everybody relates to a different O'Connor daughter!! I actually LOVE Charity, and those who relate to her, like me, seem to love APR the best of the DOB, as do I. I'm guessing you did not like her a whole lot in APMP, which is case with most of my readers, but I promise you, Helen, that you will LOVE her by Sean and Emma's story, A Heart Revealed, because she is SUCH a hoot and makes me laugh in almost every scene she's in. Hi Julie! Thanks for dropping by and checking out the review :) I do like Mitch, and I felt so bad for him with all that heart ache! I did find Charity rather hilarious in A Heart Revealed :) I will be reading A Passion Denied very soon, and then I'll be all done with the O'Connors ... and just waiting for A Love Surrendered. Can't wait for that one!